I’m going to let my photos speak a thousand words. 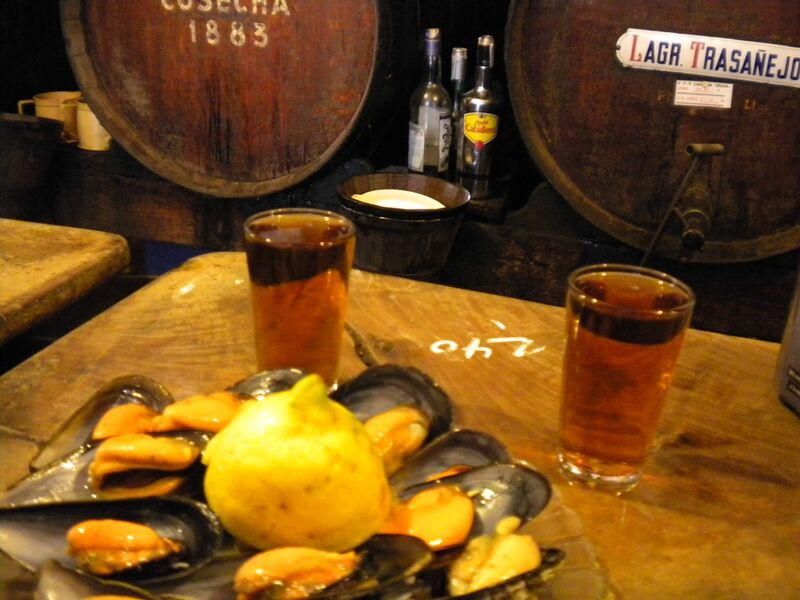 These were taken at Casa de la Guardia – a sherry bar – in downtown Malaga. 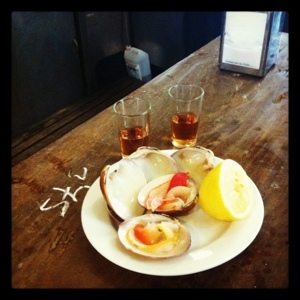 If this doesn’t make you want to start drinking sherry then that’s on your own conscience. The red clams moved when we squirted lemon juice on them. Then we ate them. Notice the bill – la cuenta – written with chalk on the bar. Sad news this past month – the passing of Juan Pedro Domecq – a true Spaniard. 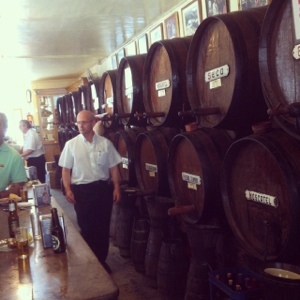 Juan Pedro comes from the Domecq family that produces world acclaimed Sherry. He was also known for the breeding of the broad-shouldered bull with the tiny waist that has become synonymous with bull fighting – think Bugs Bunny – and producing fine jamon (the famous Spanish cured leg of pig). 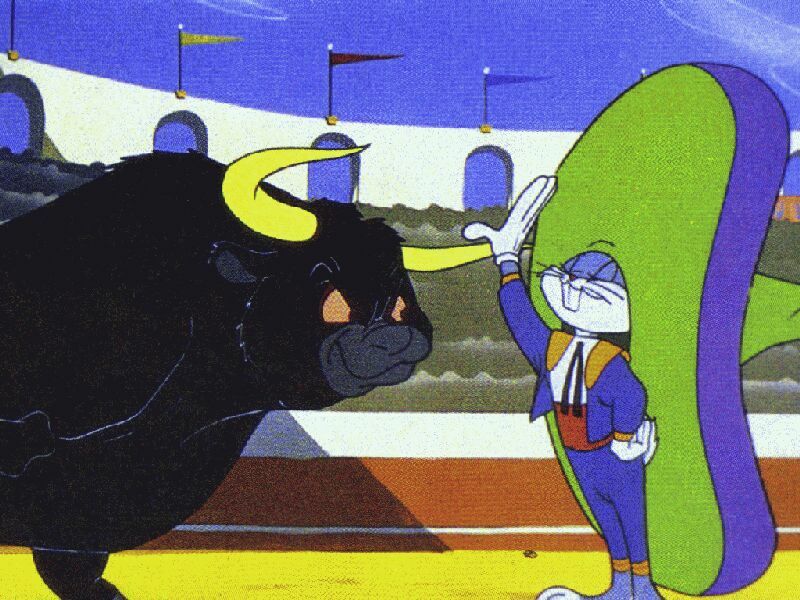 Now what Bugs Bunny is doing wearing a sombrero while bull fighting in Spain – due to another wrong turn in Albuquerque – I don’t know. But that is probably another thing that makes this bullfight funny. Domecq is one of the great Sherry houses in Spain (Jerez) and if you get a chance to buy a Fino (bone dry served chilled) or an Amontillado (medium dry and nutty) do it! MADRID – Juan Pedro Domecq Solis’s fighting bulls helped define the evolution of the bullfight in the late 20th century, adding artistry and then muscle to the ancient breed. Domecq, who died in a car crash on Monday, was one of Spain’s foremost breeders. He first developed what became known as the “artist bull,” bred to enhance sleek yet muscular lines, and later the “athlete bull,” aimed at giving a more thrilling performance while facing matadors in the bullring. Known within bullfighting circles simply as Juan Pedro, Domecq had inherited Spain’s oldest breeding estate — Veragua, founded in the 18th century — which his grandfather Juan Pedro Domecq y Nunez de Villavicencio had bought in 1939. Initially his bulls were criticized for visibly changing an ancient blood sport, but later many other breeders turned to him to buy prize breeding studs and cows. He had helped develop bulls with broader shoulders and slender waist that came to define the beasts seen on many bullrings. Domecq, who was a qualified agronomical engineer and descended from a famous sherry producing family, had in recent years also launched a company selling some of Spain’s finest “jamon” or salt-cured ham. His company said that Domecq died Monday in Higuera de la Sierra when his vehicle crashed head-on with a truck very close to his Lo Alvaro estate in southwest Spain. He was 69. Are you drinking Sherry this Christmas? Maybe this photo will inspire you to start a Spanish tradition. 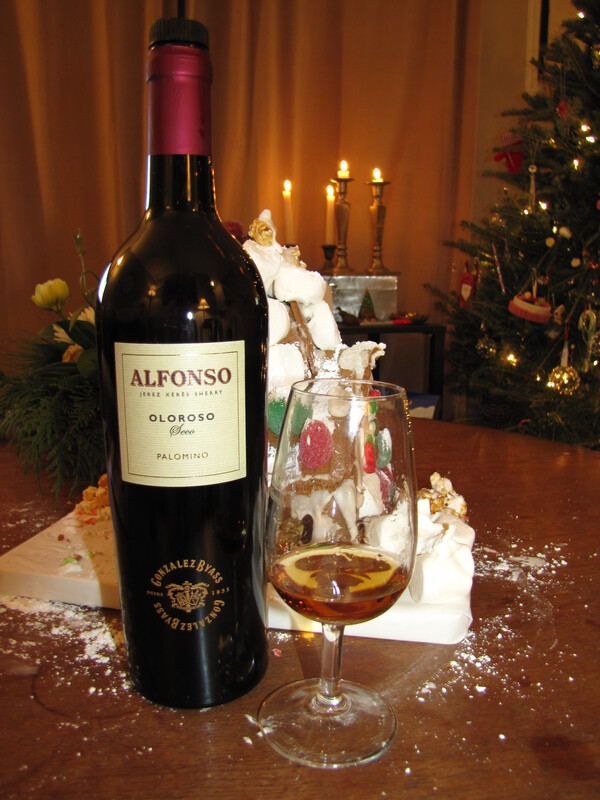 A nice dry (seco) sherry pairs well with fruitcake, gingerbread houses, and candlelight.